"Oteage Psychics (お手上げサイキクス)" by Shiggy Jr.
Yare yare, Saiki has ended. The comedy is on par with season 02, but the ending itself was quite underwhelming. It's disappointing to see this one go and it surely didn't feel like the author pushed it all the way with this "conclusion". Given, it is rare to see fully satisfying endings for comedy series but this one was downright cop-out. Since Saiki has so often delivered, I can't help but feel it could have -very realistically- been something more. If these had been your average episodes inserted in full season, I wouldn't complain at all, but since these are supposedly the last after taste, I will only call them good. I am glad these were made, but as a whole I can't say my expectations were fully met. A lot could be said about Saiki Kusuo no Psi-Nan. But in all honesty, that a lot would mean nothing, when this is a series you need to experience. There's no need to give a summary of the plot, you can just watch the first episode and get it. But there's one detail you will never understand with just one or even ten episodes: The magic. Saiki is more than just a comedy. Sure, it makes you laugh with almost every short, but in those jokes there's always something else. But the real point of it are the characters. They just grow on you. From the point where you first realize that Teruhashi is actually a great person, despite what she thinks, to the point where you notice Nendou might not be such an idiot... all the time, all of it is part of that magic. I could give you a thousand reasons to enjoy this show. But again, those would be meaningless. Saiki was the anime that, back in 2016, gave me back my love for anime. After many years not really caring about watching any chinese cartoons, I got curious about this overpowered guy with pink hair, and I honestly will be forever thankful for it. It's been a great ride, but I suppose everything must end. tl;dr: Saiki is funny as hell but it can also be wholesome, go watch it. I really enjoyed this series because it is one of the only animes that make me laugh out loud (not just snort with my nose). This ending episode had both comedy and it made me feel happy. And according to me Saiki as a character, grows and shows other sides than just the "Yare Yare"-part. The only thing that was negative was that I thought it had a bit of an abrupt ending. But I found out that there are two more chapters that the creators did before quitting! So a quick google search for "Saiki k giga chapters" gave me a more satisfying ending and I recommend anyone who watched Saiki Kusuo to read them! After 2 full seasons of the popular comedy anime Saiki Kusuo no Ψ-nan, these 2 episodes (put into one special) mark the end of the anime. Was it as good as the other seasons and did it end with a satisfying conclusion though? Although the story of Saiki Kusuo no Ψ-nan was never its strongest point (like it was intended), the story always did leave explanations in a comedic way for all kinds of things in the anime. For example, why the characters all have unnatural hair colours or why they celebrated Christmas and new year multiple times, while Saiki was in his second year of high school. This trend continues with this special explaining what Saiki's second hairpin does and ending the overarching storyline first explained in the second season. The art and animation in this special were pretty good and seemed a lot like the rest of the series, although it felt like the animation was slightly improved compared to the previous seasons. The opening and ending animation were the same as the second opening and ending of the second season. The sound was like the previous season of the anime. The soundtrack, except for the opening and ending theme was not very exceptional and the characters were still voiced very well, like previous seasons. Saiki Kusuo no Ψ-nan has always been an interesting anime with its characters, which is no different in this season. The characters still have their same enjoyable character interactions, Saiki is still being very tsundere-like around his friends, Teruhashi still wants Saiki to say 'offu' and Kaidou still believes in the evil organisation 'Dark Reunion'. There even is a romantic confession for one of the potential relationships talked about in the anime. If you liked the characters in the previous seasons, you will probably like them in this special in the same way and vice versa. As always, Saiki Kusuo no Ψ-nan has been very enjoyable for me. This special continues with many of the comedic moments of the previous seasons as well as creating some new very comedic moments. The different character interactions and small storylines they created this time were enjoyable as well. A big downside is the ending not really being a satisfying ending after 50 episodes of the anime. It was very enjoyable overall, but somewhat less than the previous seasons. As always, the anime has delivered very well on its main point, the comedy. The anime used many of its funny comedic trends introduced in its previous seasons and used them effectively in this special as well. There are also many new comedic events introduced also having to do with for example Saiki Kusuo and his brother Kuusuke. This special (probably) marks the end of the anime, but it does not really give a satisfying ending. In the second episode of the special the overarching story in the background of the anime gets resolved, but it is done in such a way that I cannot really see it as a satisfying conclusion. The last moments of the special also use one of the comedic trends in the series, which in this situation, results in an open end of the anime, which I do not think the fans really deserved after these 50 episodes. 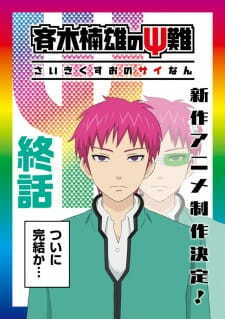 Saiki Kusuo no Ψ-nan: Kanketsu-hen once again showed us the things we like (or do not like) about the anime with a simplistic story, still explaining many things in a comedic way, the simple but pretty good animation and sound used for many comedic elements, many character traits and different interactions of the characters and its enjoyability through its comedy. A real downside to this special is the more dissatisfying ending, not ending the series on a really good note. However, overall this was a pretty good special.